Just then, Jaxxon & Amaiza fly out to engage Valance's ship, then trick him into thinking Jaxxon's ship is badly damaged when they retreat to the planet's surface. After Valance's men storm out on foot, Jaxxon & Amaiza attack from the tall grass, while Jimm triggers a bantha stampede that makes short work of them, leaving only Valance alive. When Jaxxon asks why he's after Jimm, Valance, upon seeing the boy, realizes he's not the one he's after. Enraged that he wasted so much on nothing, he fires a blast of energy from his hand and runs to his ship. 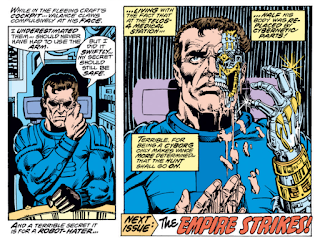 Flying off, Valance realizes the boy he's after is still out there, and compulsively peels at the skin on his face, revealing the cybernetic parts beneath, given to him on Telos-4 after he was injured in combat, a terrible fate for someone who hates droids as much as he does. 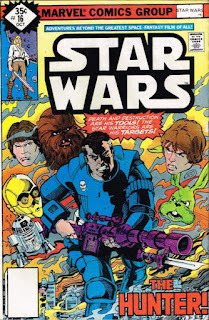 This issue is the first appearance of Valance the Hunter, a former Stormtrooper-turned-bounty hunter who was made into a cyborg after being wounded in battle, an ironic twist given his hatred of droids. He is targeting Luke Skywalker due to reports that the Death Star was destroyed in part by someone who is friends with droids. He doesn't know Luke's specific idenity, but is aware of Han's involvement in the Death Star's destruction and that Han is friends with Luke. 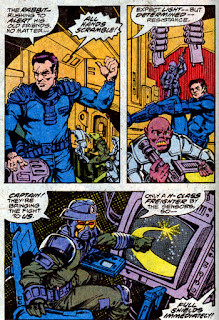 Valance marks the first appearance in the Expanded Universe of a popular character type: the bounty hunter (Greedo was operating as one in Star Wars, of course, though he was never referred to as such in the film itself). Bounty Hunters are now a mainstay of the Star Wars universe (helped in lage part by the popularity of Boba Fett following his appearance in The Empire Strikes Back), a type of character as important as Rebel/Imperial and Jedi/Sith. 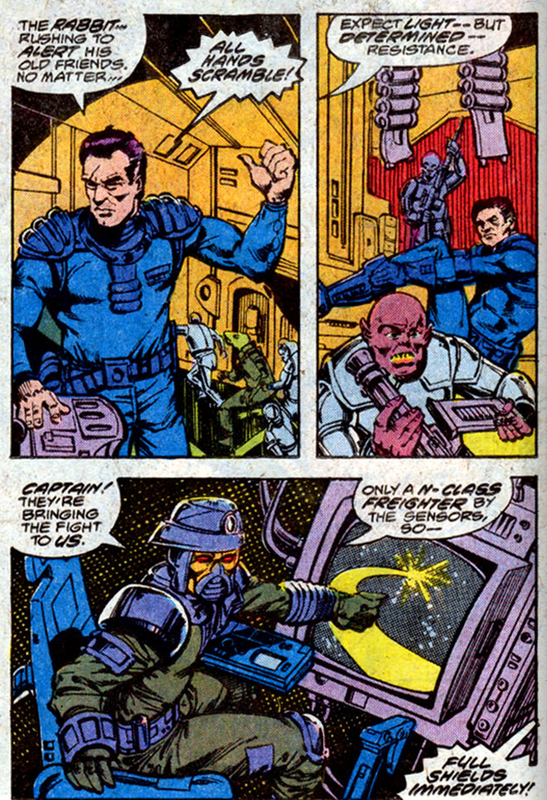 Valance's origin also serves as the introduction to another popular, though less common, Star Wars trope, that of the former Stormtrooper-turned-bounty hunter/Rebel/whatever (Boba Fett being a fallen Stormtrooper was a popular theory regarding his origin for many years, before the Prequels came along and both confirmed and denied it). 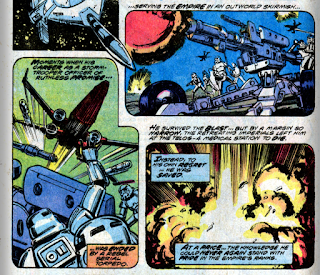 Valance's hatred of droids is another recurring Star Wars trope that pops up from time-to-time. 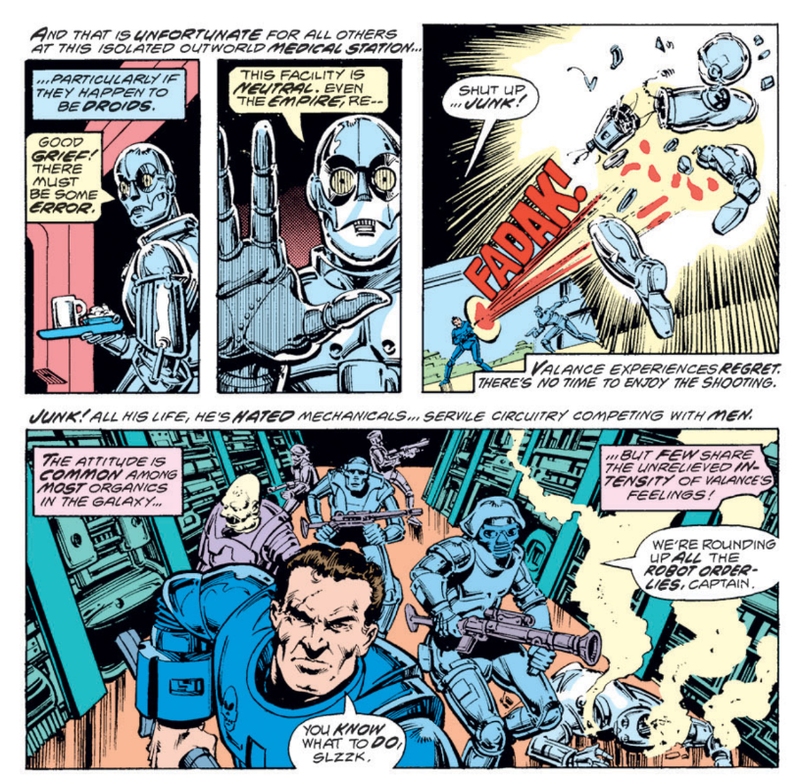 Though rarely is anyone as anti-droid as Valance (despite this issue insisting it's a common attitude in the galaxy), the idea of droids as both second class citizens and subjects of prejudice is something of an undercurrent that runs through some Expanded Universe fiction, essentially building off the "we don't serve their kind" line when Luke and the droids first enter the cantina in A New Hope. Valance's quest to find Luke Skywalker brings him into contact with the remaining Star-Hoppers of Aduba-3, from the series' first post-film adaptation story, and this issue serves as swan song for most of them, as we won't see them again after this. To wit, Don Wan Khiotay passes away (for real this time), while Jimm the Starkiller Kid, Jaxxon and Amaiza all turn up as well, with Jaxxon and Amaiza effectively serving as the protagonists of this issue's story, and though those three survive this story, they won't appear in the series again. Walt Simonson, best known for his iconic run as writer/artist on Thor in the 80s, guest-pencils this issue (and is joined by his long-time inker Bob Wiacek). 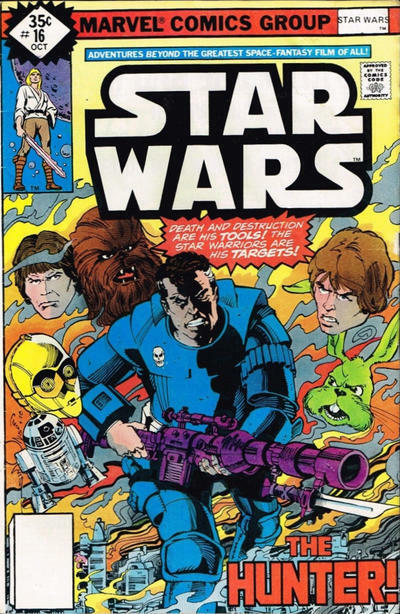 Simonson will later return to Star Wars for a run as both the regular artist and writer on the book. The next issue box at the end of the issue seems to be a reference to the start of the next storyline, which actually occurs in issue #18. 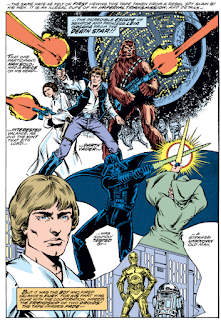 Next issue is a Luke flashback story with an entirely different creative team, suggesting it got slotted in at the last minute. Valance's first mate is said to be Hutlarian, a species I don't believe gets mentioned again. He wears armor throughout the issue, so it's tough to say what the physical characteristics of the species even are. It's revealed that Jim has married Merri, the elder's daughter on Aduba-3 (whom Han was briefly infatuated with). Jaxxon's ship is described as being a "N-class freighter", a very Star Trek kind of designation (most ship classes in the Star Wars universe use weight-related terms ie the Millennium Falcon is a "light freighter"). Jaxxon is again referred to as a "rabbit" throughout the issue, and his ship is named the "Rabbit's Foot". En route to Aduba-3, Valance makes his men watch the data tapes detailing the destruction of the Death Star, providing a handy excuse for another recap of the events of the movie. Jaxxon, who is not unlike a green Bugs Bunny in appearance & temperament, is tortured by two of Valance's men named "Fud" and "Dafi". I probably lack the necessary critical skills to make this declaration objectively, but for me, this issue features the strongest art of the series yet. While Walt Simonson's signature style only appears on the fringes of his work here, the art is nonetheless dynamic, compelling and energetic. Figures within panels are larger and bolder than ever, the linework is detailed yet crisp, the panel layouts keep the pacing brisk, while Jaxxon and the returning Star-Hoppers look better than they ever have. I've mostly enjoyed Infantino's work on the series, but this is nonetheless some top notch stuff, even if it isn't yet classic Simonson. Similarly, in Valance the Hunter, this issue introduces the series' best original character yet, who, in just one appearance, captivates and sparks the imagination in a way that none of the Star-Hoppers, Governor Quarg, etc. were able to do. The "fallen Stormtrooper" routine will occur often enough to become something of a trope in the Expanded Universe, but it's relatively fresh here (and, significantly, not the defining characteristic of Valance). And while the "hates robuts" motivation is a reclaimed sci-fi trope and the way it informs Valance's specific beef with Luke is a bit over-the-top (is Luke really the only notable person in the galaxy who is friends with droids? To the point that mere rumors of him are enough to capture Valance's full attention), it's nevertheless refreshing to see an antagonist with a motivation beyond either "is Imperial" or "personal greed". The twist, that Valance's robo-hatred is tied in with the fact that he was made a cyborg against his will is another classic sci-fi trope claimed by the series, but it works, both in terms of making Valance read like a fully-formed character and in giving the issue a strong note, both in-story and visually, on which to end. 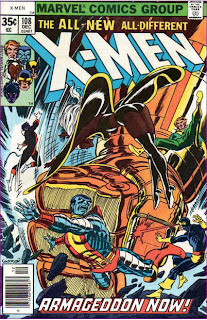 Between the top-notch art and Valance himself, the end result is, despite the lack of any of the book's main characters, the best issue of the series yet, a great example of what the series can do independent of the film, and an effective done-in-one that nevertheless connects with the short history of the series. Chris Claremont fills in as Luke takes the spotlight. Dan Fraga claims that Valance the Hunter here is who Rob Liefeld stole the idea for Cable from. So Louise and Walt should perhaps be credited as Cable's original creators!? Personally, I still like Carmine Infantino's work on the series better than Simonson's. I can't really articulate why, though. 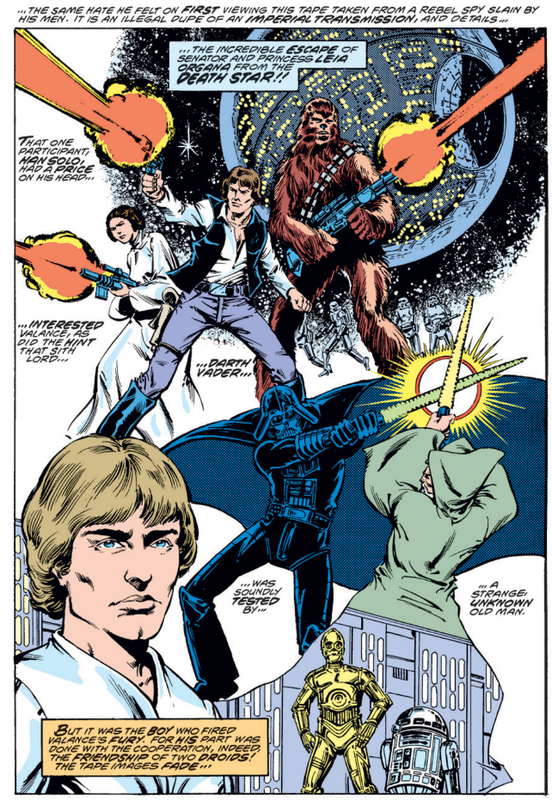 I guess Simonson's stuff looks like a comic book, while Infantino's style as seen here reminds me more of a comic strip, which seems a more appropriate medium for STAR WARS. I was trying to figure out why Valance randomly hates Luke with such a passion and I came up with this, though it's not explicitly stated in the text: Valance seemed pretty proud of his career in the Empire, so perhaps he wants to avenge the Death Star's destruction since he learned it was brought about by a droid-lover. I didn't catch Fud and Dafi -- funny. 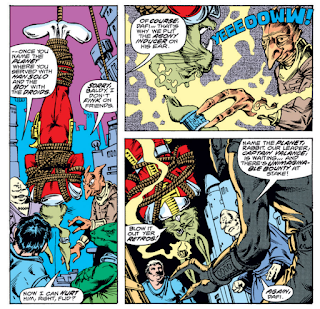 Though I did notice Jaxxon telling them if he wasn't hanging upside down, he'd ask them "What's up?" So they got an agony inducer which is essentially a ring they can slip on things? Heartless bastards. He does say he expects the Empire to pay handsomely when Luke is handed over, even as the captions semi-omnisciently wonder if — for the reasons you state — he wouldn’t hunt down the boy and his droids for nothing. I appreciated the revisitation of the supporting cast despite the fact that most were eye-rolling back during the story that introduced them; whether due to Goodwin’s handling of them or just the nod to continuity, it gives the series some added dimension. Jimm sure knocked up his new wife right quick.